Thank you for making 2016 a year to remember in the loyalty business. A year of devaluation announcements, revoking benefits, adding ever more complex learning rules, for implementing immediate rules and restrictions without notice, for not giving me any points when being loyal to the alliance on an economy ticket, for jacking up award ticket rates, for increasing fees across the board, for rewarding the average joe who takes out 10 credit cards more than a long time loyal flyer who spends $10,000’s, for denying lounge access when clearly I’m entitled and most of all, thank you for not showing any innovative or creativity that might actually encourage me to earn more points and get inside your plane more often. While you’ve been hard at work figuring out how to erode program benefits, trying to out-do each other in the lack of creativity and generally racing to the bottom; I took it upon myself to figure out how it would be possible to do the exact opposite. To discover, plan, analyse and cultivate new, simple ways that would bring new life to the program, by dreaming up ways to give away more benefits, more miles and generate more revenues for the FFP in the process. 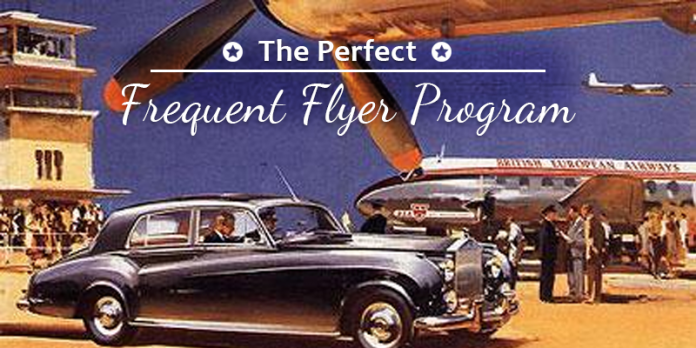 Basically, I created the perfect frequent flyer program. FFPs of the world, I’ll cut you some slack. Your teams are likely already busy implementing the world’s best use of big data, where I show you step by step on how to extract more revenue from each potential customer booking a flight on your website. Or maybe you’re busy in strategy meetings discussing how to understand/measure what constitutes a valuable customer when they may have zero credit cards and zero flight spend. Or perhaps you’ve blown the entire 2016 budget (aka GDP of a small country) by trying to crack the code with big data analysis and your 9000 Hadoop servers running 24/7 attempting the next big breakthrough in data science. Either way, you’re a bit busy! So – to help take some weight off your shoulders, I put in the hard yards and created the perfect loyalty program. One that would help foster a culture of loyalty and not rely on incentivizing the member base, one that brings new benefits to members without costing the FFP a cent. The concept being: – to drive new business and new revenue opportunities into the program and home airline. Fundamentally, a program that doesn’t diminish overall program value and forms exclusive benefits while generating new income for the FFP program in the process. A program that allows for increased points redemption opportunities without impacting revenue seat sales. Has increased scope for genuinely cultivating loyalty among program members without giving away upgrades, more miles and countless apologetic emails. A method whereby you’re able to identify & pinpoint new opportunities *before* they are on the radar of your competitors. A way to charge new fees, for new products that passengers/members will pay for (even top-tier members) without making them feel like you’re nickel and diming them. New upsells during the payment process that cost you next to nothing – yet will bring in new proceeds, and passengers will embrace the upsell as a positive move. 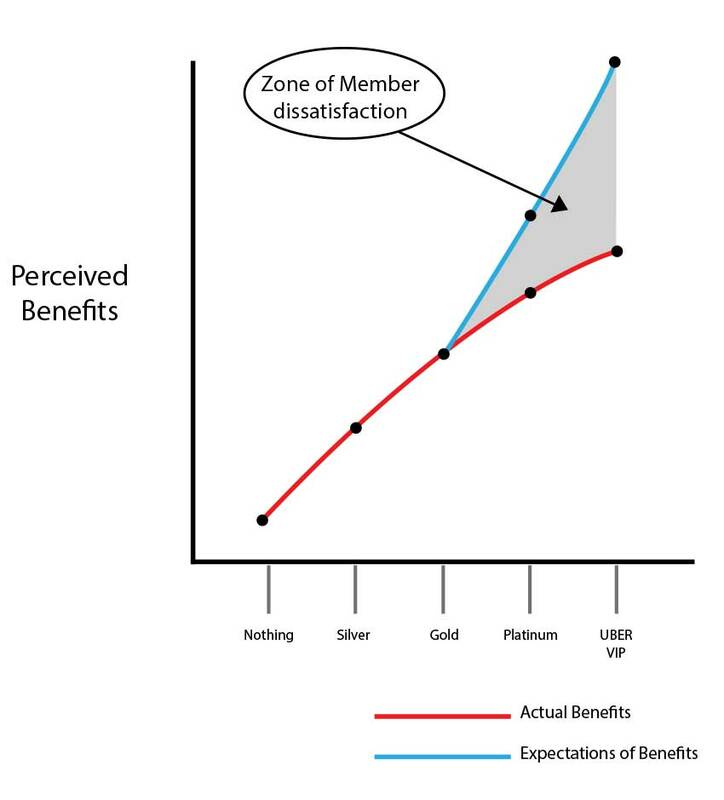 One that doesn’t offer linear benefits to status members, but rather incrementally adds perceived value to the FFP as the member works their way up through the status tier ranks (see below). A means to receive something back from a passenger when you give them a free/operational upgrade, where the passenger will want to give back. A series of approaches which would wipe out ‘mileage runners’; without turning your program into a revenue-based business. On the flip side, opposite actions could be taken to encourage and gamify certain elements of the program. A program that provides more subjective (non-air) redemption channels where the points to dollars ratio is entirely subjective and reliant on what the member values them on. A way to link credit cards on a global scale so that points earning opportunities can multiple well beyond the scope of everyday purchases. A pricing mechanism with banks and financial institutions that rewards and encourages particular behaviour without reliance on interchange fees as the revenue spinner. A method to increase profitability through innovation without flooding the market with endless cheap points promotions that long term do nothing but erode the value and destroy customer behaviour on airlines that DON’T offer these promotions. A way to identify and hand select individual high-value frequent flyers through big data and automatically devise methods to attract them to your airline and your frequent flyer program without the need for any marketing spend. Ways in which you can learn more about customers who matter most to you in each micro-segment without wasting money on surveys focus groups and ‘VIP Panels’. How to add significant value to members of your program who are not able to fly with your airline/alliance that day; – and without the need for an agreement with competing airlines or any government approval. A method to micro-segment customers on a near individual basis, grouped by their top driving factors on purchase decision making (which may change from day to day), and step by step data-driven method on how to enact upon this and measure the ROI. An approach to cross-pollinate inter-industry opportunities so that both your problems and those of complimentary services are solved in one swoop. All while boosting your revenues in the process. None of this requires teams of data scientists, business intelligence professionals, millions of dollars in marketing or upgrading any IT systems. Best of all – most of this could be implemented in a way that creates a barrier around your new product so the competition would struggle to cherry pick your new revenue generating loyalty innovations. Could it possibly be any more perfect? I could lay out all of my suite of juicy details of the perfect FFP (how and why everything fits together and the logic behind everything – backed with numbers), but who are we kidding… nobody needs an innovative, super high margin, perfectly gamified, globally recognized loyalty program that exceeds the wants of customers and eclipses revenue projections for corporations.